Journal 52's prompt this week was make a snowman. This page is done in my altered Recipe book. The background has blue, magenta and pink paint on it. I wanted him to be a little 3D so I used embossing paste and a palette knife to make him. I love how he's not completely round. 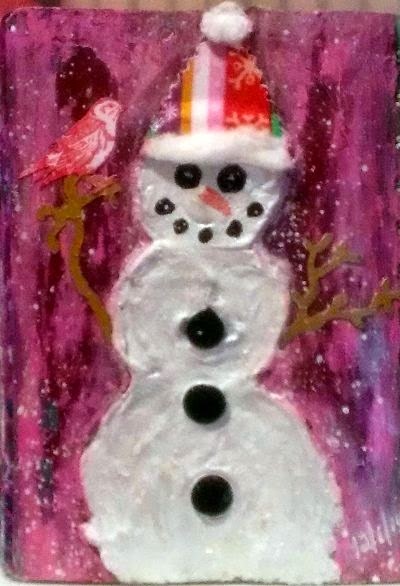 Using a palette knife was not so easy for me but I think it gave him the look of a real snowman. My embossing paste was a odd blue color because it was left over from another project. I painted over the paste with gesso and while it was wet I pressed black round disks into him for his buttons. Then I let it dry for 24 hours. I put a coat of Artist Loft iridescent paint on him to give him a little shine. His hat is a piece of fabric that I cut with pinking shears. The ball and fluff on his hat are made from a cotton ball. His arms are the branch from the Sizzix Bird Branch die painted with gold paint. The little bird is a stamp from a set I purchased at Tuesday Morning. This face is black sharpie paint pen and a orange paint pen. I made the background snow by mixing a bit of metallic white paint with water and splattered it with a paint brush. My friend Bibi at Rubber Dance is having a blue, pink and purple challenge on her blog. I thought I'd link to it too. She is also having a sale on her stamps because December is her birthday month. Check it out. She has wonderful stamps.